As I have been posting so far, I enjoyed my last trip to Israel and Europe, and I am almost done with my Israeli winery posts. Last we left off, I was talking about – Domaine du Castel Winery. However, that was the third winery that we visited that day – the third of the four wineries that make up the Judean Hills quartet, three of which are kosher. We visited all three of them on that Friday, and in this post, I will cover the second of those three – that one being Tzora Vineyards Winery. I have already posted here about my appreciation for the Judean Hills quartet, I think what they are doing is great and is the correct way to go after the gaping sinkhole in what some would call Israeli wine education. 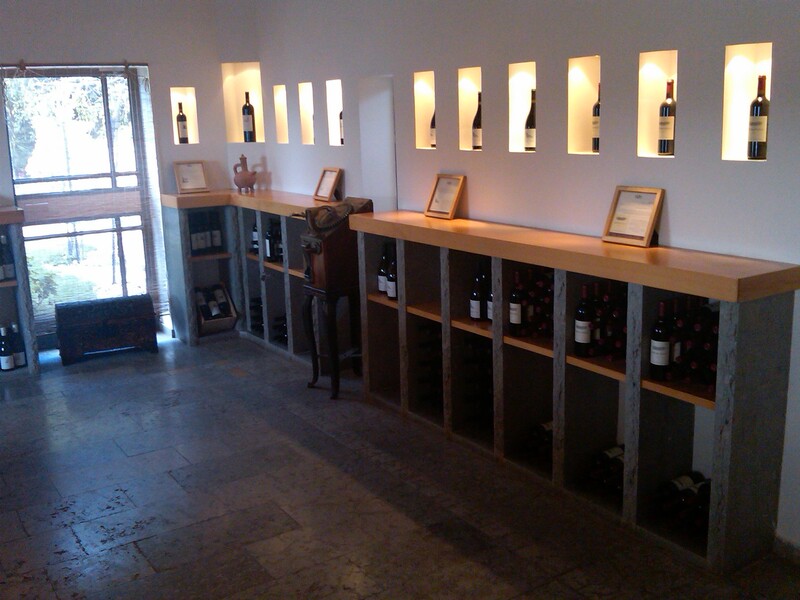 They happen to also be some of the best wineries in Israel, which is a blessing. Who would want Yarden pushing their date juice and declaring this is the future of Israel’s wine revolution?? Instead, you have wineries like Domaine du Castel Winery, Flam Winery, and Tzora Vineyards, along with a winery I wish I could enjoy, though sadly it is not kosher – Sphera Winery – run byDoron Rav Hon, who made some of the best Chardonnays and Pinot Noir in Israel when he was in Ella Valley – those were great days!! As we arrived that morning, Eran Pick was busy crushing the last of his red grapes – the Petit Verdot. The last grape that Tzora takes in is the late harvest Gewurztraminer that is used in the making of the lovely Or wine – that is “frozen” late harvest Gewurztraminer. 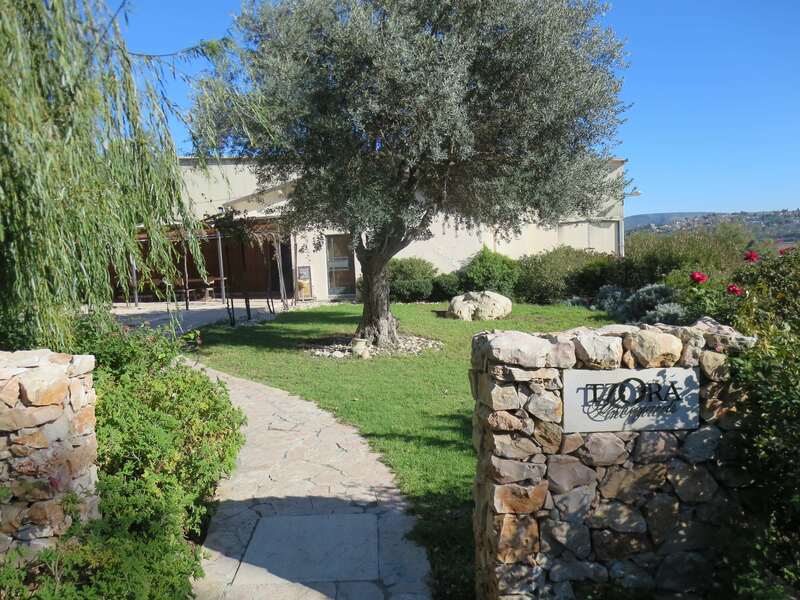 It had not been long since I was last at Tzora Winery, but there were new wines to taste, the newly bottled Misty Hills and the 2016 whites, as well. Sadly, as stated, Mr. Pick was busy with the last of harvest, but we still had the chance to taste the wines with him, as he came to talk to us for a few minutes, and he even threw a few barrel/tank tastings in as well. Once again, the winery put out these incredibly fragile and lovely wine glasses, from Zalto – just to make sure we were on our toes during the tasting and very careful! As always, Tzora Winery has three labels. The first is Judean Hills with two wines under it, a red blend and a white blend. Next is the Shoresh label, it also has a red blend and a white wine as well, that is pure Sauvignon Blanc. The Shoresh brand also has the dessert wine called Or. Finally, there is the flagship wine – Misty Hills. We were a large group that descended upon the winery, AO, JK, and his wife, OM, MB, and myself. We had the chance to taste through the current wines plus two extra older library wines, and some early barrel tastings, but I did not post those as barrels are for Eran to work with, I normally only write notes of bottled wines. 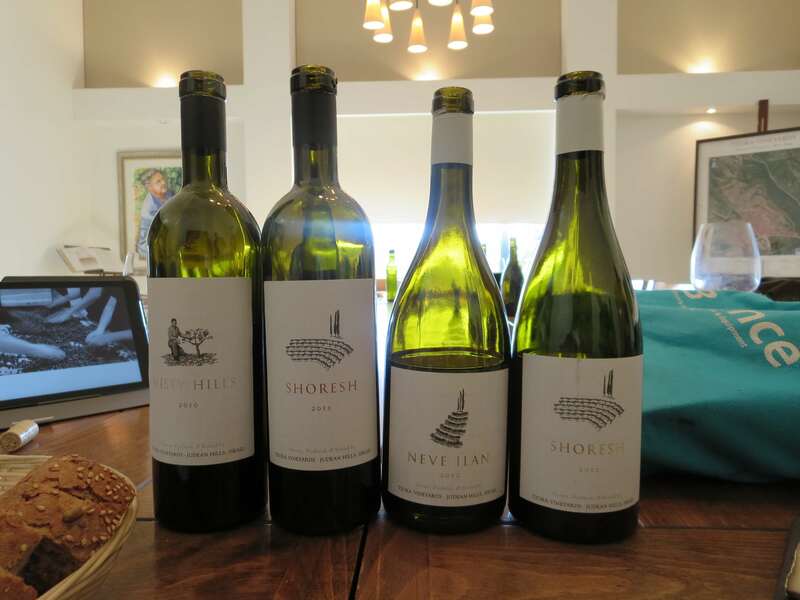 Last time we were at the winery was in March, and we tasted many great wines – and we did taste a few of those wines again, along with the now bottled 2015 Tzora Misty Hills, and some library wines. Well, I have finished all the KFWE posts, and my past personal wine tastings posts, and now it is time to get back to posting about wineries I visited on my last trip. To remind you, I came to Israel for Sommelier 2017, then flew to Paris and back the next morning for the Bokobsa tasting. Upon my return to Israel, I drove north for a day, before coming back to the Jerusalem area, and then flying home. I have already posted all the wineries I visited in Israel’s North. 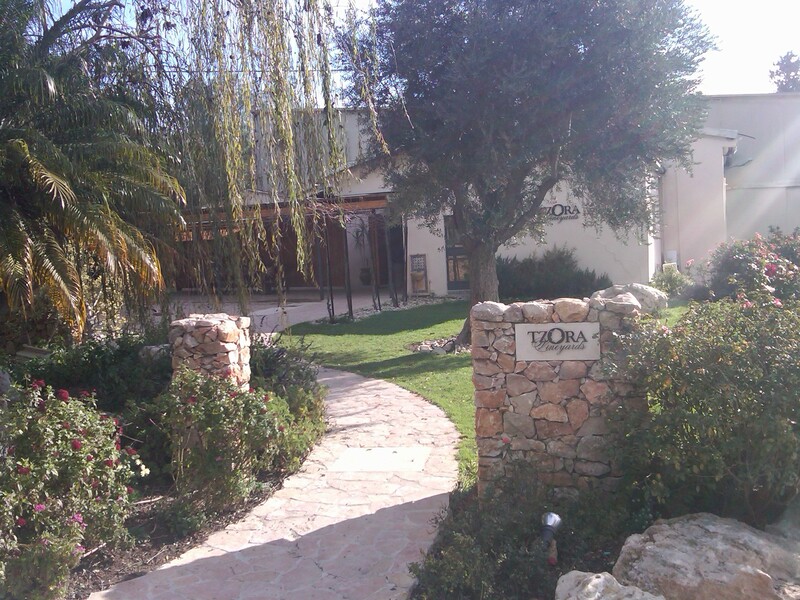 I also visited wineries in the Jerusalem area, including one of my absolute favorite kosher wineries in the world – Tzora Vineyards Winery. Why? Because Tzora (and Domaine Netofa Winery as well) are wineries that prove you can make GREAT old-world style wines in the new world of Israel! All that you really need to make great balanced and beautifully made wines is to care, and Tzora winery cares! If there is a winery that gets terroir in Israel it would be Tzora. I wrote about the late founder, Ronnie James, who sadly passed away in 2008. He saw the power of terroir in Israel. He understood what vines to plant where and why! It was his passion and belief that great wines could be made in Israel, that continues to fuel Eran Pick MW (Master Of Wine), the head winemaker and General Manager of Tzora Vineyards and the rest of the winery, forward. I have had the honor to meet with Mr. Pick many times at the winery now, and each time it is always a joy to see how the winery continues to grow leaps and bounds above the rest of Israel’s date juice producing masses. For the few that can understand the quality and beauty of Tzora’s wines, there is a treasure to be reaped for sure! Here is a winery that cares, and does not sell out to the million bottle siren and the date juice wines that it demands. It had not been long since I was last at Tzora Winery, but there were new wines to taste, the new Misty Hills and the new red Shoresh, as well. Mr. Pick was very kind to do the tasting with us, and he even had the winery put out these incredibly fragile and lovely wine glasses, from Zalto – just to make sure we were on our toes and very careful! The glasses were the first surprise, but the second one was the insane wine we tasted at the end of the tasting. It was a wine that is yet to be bottled but one that has already been pulled from the barrel, the 2015 Misty Hills. I swear that if I was tasting blind, I could have guessed it was a 2012 Saint Emilion. 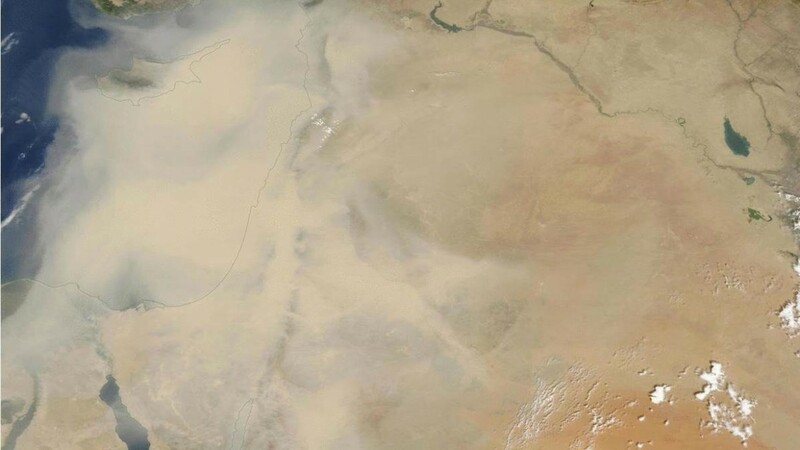 It was bone dry, old-world in the absolute real sense, and did not taste ripe or Israeli in any manner. We also got a blind taste test and sadly this time, I did not get it. The blind tasted wine was a glass of pure Petit Verdot, it was very ripe and somewhat unidimensional, but its color, depth, and tannin were really impressive. Eran allowed us to taste components of the Judean Hills Blanc 2016 and some of the 2016 Shoresh blanc as well, they both showed beautifully, but till those wines are complete and put in a bottle, I will hold my notes. The best news (for me anyway) is that Skurnik Wines, who has been importing Tzora wines for many years now, has all of these wines in NYC! However, the even better news is that they will also be on the west coast very soon! Yes, can you believe it, someone finally listened to me, and Skurnik will have a West coast distribution setup, and ready to go by May 2017! Finally! The wines are available from Gary at Taste Co – email him at: info@tastewineco.com or call at (212) 461-1708. Some of them are also available at kosherwine.com and skyviewwine.com. Say the word terroir and most folk’s thoughts would consciously, or maybe sub-consciously jump to France, heck the word is French after all. Still, ask what does it mean, and now we are off the races. Why? Because other than its literal translation; land or sense of place, there is no real translation for terroir. I think that is fitting in a way, as the word has really just started its long and obviously complicated journey. According to the incomparable Harold McGee and Daniel Patterson, it all started in the 17th century, when used to describe a wine, in a non-complementary way. My! Fast forward to 1831, when it was first used as a compliment! From there, it has evolved over and over, like clay, or silt, or maybe rocks, in the hand of a potter, changing and evolving to meet the needs of place and/or time. While researching this article I spent a good few hours, heck days, searching the real meaning of the word terroir. I almost felt like Indiana Jones on the search for the Ark of the Covenant. No matter how hard I searched, no matter the words I typed into the oracle of the web, all I got were old and stale answers. Finally, I fell upon the father of wine tasting, Eric Asimov’s, blog posting on the fore mentioned article, and I screamed Eureka (yeah my wife was not impressed)! On an aside, Harold McGee is my generation’s original scientific foodie, his books are the bible to many of our nowadays chef demi-gods gastronomical feats. It comes as no shock to me that he would be my knight in shining armor, remember wine may well be romantic in verse and scripture, but it is a chemical at its most base, in other words, dead center in Mr. McGee’s wheelhouse! As I have been posting so far, I enjoyed my last trip to Israel and Europe, and this will be the last post about Israeli wineries for this trip anyway! 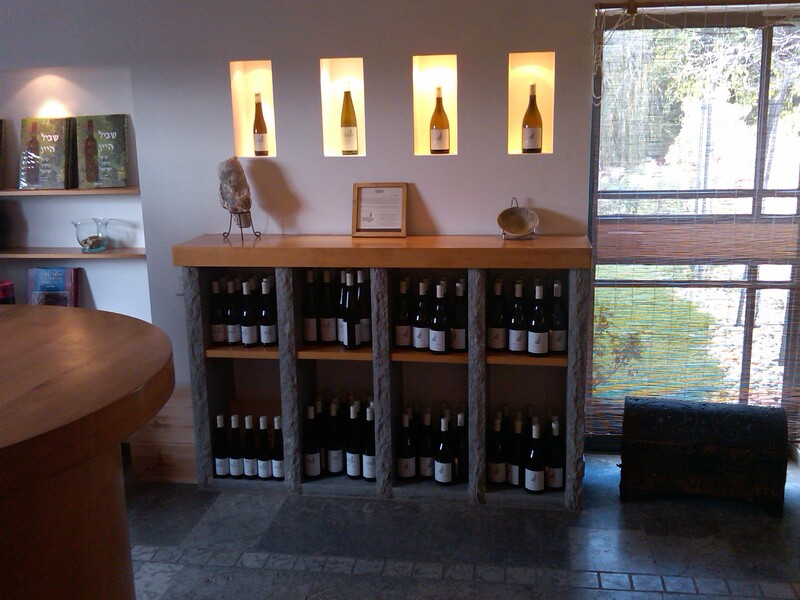 Last we left off, I was talking about – Tzora Vineyards Winery. However, that was the third winery that we visited that day – the third of the four wineries that make up the Judean Hills quartet, three of which are kosher. We visited all three of the kosher wines from the Judean Hills Quartet on that Friday, and in this post, I will cover the first of those three that we visited that day – that one being Flam Winery. This will be my last post from my trip to Israel, the next ones will be about my epic tasting in France and Riesling wines from Mosel. Also, a side note, the winery that brings us the wonderful Rieslings and Sylvaner – Nik Weiss, is a sister winery to Flam Winery. Actually, Gilad brought out a bottle of the 2015 Nik Weiss Riesling and we told him that we had issues initially with the wine, but now understand that these wines take years to come around (flavor and fruit characteristic wise) and that he should save his next bottle for a few years from now. If you look at the four wineries in the quartet, three of them have used Judean Hills grapes since the very beginning, Domaine du Castel Winery, Tzora Vineyards, and Sephora Winery. Both Castel and Tzora built their name and reputation and essence upon the terroir of the Judean Hills. Flam has always been using Judean Hills fruit in its wines, but the reserve wines have been sourced from the Upper Galilee (Ben Zimra and Dishon). That is changing now, the winery has planted 100 dunams on the beautiful slopes near Ein Kerem and the first wine from the Judean Hills is the 2015 Merlot Reserve. Once they complete the move from the Galilee to the Judean Hills for their reserve wines as well, the majority of its red wines will be sourced from the Judean Hills. At this time, the Rose, Blanc, and Classico are all sourced from the Judean Hills, with the most of the reserve wines being sourced from the Upper Galilee. We were a large group that descended upon the winery, AO, JK, and his wife, OM, MB, and myself. 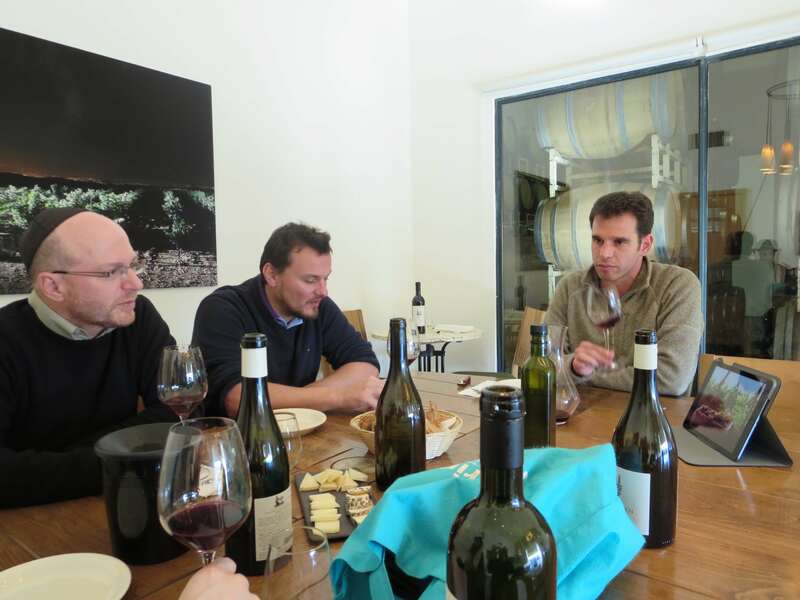 We had the chance to taste through the current wines plus the not yet released but already bottled 2013 Flam Noble – the winery’s flagship wine. We were met by both Gilad and Golan Flam, and later for a bit by Israel as well. Golan, the winemaker, and Gilad who runs the winery were very kind to meet with us as was visible from the previous posts of this trip, it was harvest time, and Golan had to run to tend to the grapes. We did get a chance to watch some of the winemaking activities and then it was off to taste the currently released wines. The wines once again show the professionalism and passion that is Flam Winery. As the first post I ever wrote about the winery shows, this is a family run winery and that focuses as much of its efforts in the vineyards as they do in the winery itself. This wine tasted better than the last time we had it, with tart and crisp fruit, showing nice pith, lovely grapefruit, and green apple galore. The mouth is crisp and alive and tart with good balance and nice fruit and good spice, but lacks anything to grab you. The finish is long and rich and crisp, very refreshing. The wine shows a bit too much oak now, nice enough, but a bit too much oak with crazy chocolate and elegance with more of the reserve fruit going into the Classico in 2015. The nose shows herb sweet dill, and good earth, and red fruit. The mouth is medium bodied and dark cherry, rich roasted herb, nice round and spicy with great sweet but controlled fruit and menthol and green notes abound. The extra syrah is showing with hints of blue notes but really nice with foliage and tobacco galore, but lacking complexity of previous vintages and a bit too much oak. This is the first vintage being sourced from the Judean hills. The nose on this wine shows a very rich oaky nose with red fruit and green notes. The mouth on this medium bodied wine is rich and layered but lacking the acid, but really impressed by what the be vineyards will bring. The mouth shows mouth coating tannin with elegance, dark raspberry, with hints of dark currant, mineral, foliage, dirt, and loam galore, with great potential. The finish is long and elegant with chocolate, tobacco, and ripe fruit lingers long. Nice nose of bright mineral, rich earth and really ripe fruit. The mouth is ripe and plush with green notes and really accessible showing nice tannin and plush blackberry and foliage. The finish is long and green and soft with mineral and tobacco and loam. The nose on this wine shows lovely blue and black fruit, with perfumed boysenberry, with less herb and more floral and blue fruit instead. The mouth is rich and full bodied and really accessible with a plush and a bit less pushed than the other two reserve wines, with nice extraction, good sweet fruit, controlled with green notes again and foliage that is wrapped in plush but firm tannin and great spice. The finish is long and sweet and really impressive with leather galore and tobacco that is backed by tar and roasted animal. Really lovely old world nose with nice mineral, rich black and elegant fruit with great roasted herb. The mouth is full bodied, plush, not overly tannic with nice elegance and good complexity that is ripe and round and yet balanced with chocolate and nice graphite and mineral. The finish is long and green with tobacco, sweet dill, rich extraction that shows searing tannin that lingers and ripe black fruit with juicy tart raspberry, and fun blue notes in the background, with ripe fruit lingering long.